Psyllium Whole Husks is an economically priced colon cleansing dietary fiber for promoting regularity and supporting heart health. It is most effective when used everyday, and can be used as long as desired. There are many reasons why psyllium husks are a part of daily health maintenance for millions of people. Extensive research has shown that psyllium husks help maintain healthy cholesterol levels, including a proper balance of HDL and LDL cholesterol. In addition, psyllium husks help promote normal regularity. Unlike stimulant laxatives, psyllium husks are gentle and are not habit forming. Psyllium husks' bulking action makes elimination easier and more comfortable. At the same time, psyllium sweeps waste and toxins more quickly out of the body, so toxins are not reabsorbed from the colon back into the bloodstream. Gluten-Free: psyllium husks do not contain any gluten so people who are gluten sensitive can use them. Yerba Prima uses only premium quality psyllium husks, without added sweeteners, colors or additives. 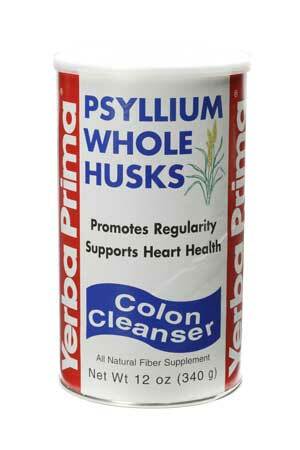 FOR REGULARITY: Psyllium husks promote easy, healthy elimination and sweep waste out of the colon more quickly. To maintain regularity and speed waste removal, take 1 to 3 servings a day, either with or between meals. SUGGESTED USE: ADULTS AND CHILDREN OVER 12: 1 tablespoon, one to three times a day. CHILDREN 6 - 12: 1 teaspoon, one to three times a day. See Directions. DIRECTIONS: Start by taking 1 serving each day. Increase to 2 or 3 servings per day if needed. Can be taken either between meals, or with food, as desired. Stir powder briskly into at least 8 ounces (a full glass) of liquid. Juice, water, soy or rice drink, and milk are all good with Psyllium Whole Husks. Drink immediately. Drinking additional liquid is helpful. If minor gas or bloating occurs, reduce the amount you take until your system adjusts. Note: The carbohydrate in this product is primarily non-digestible fiber; digestible carbohydrate is less than 1/2 gram per serving.